At the Vet's office shortly after his rescue. 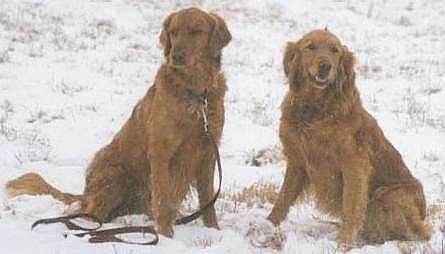 In March of 1999, LIGRR was notified about a severely injured, young, male Golden Retriever. 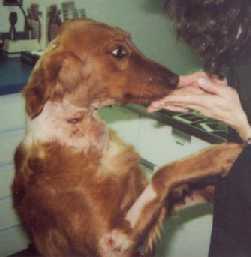 The wounds were so severe that the Vet didn't think he would survive. But this dog was a fighter and recovered. Therefore, we named him Phoenix after the bird of legend. 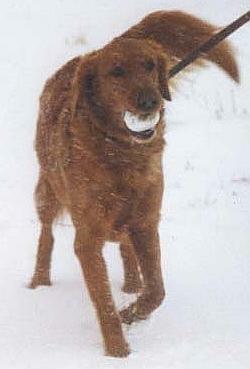 Thanks to the generosity and support of all the Golden Retriever lovers who sent in donations, Phoenix did survive and is living in North Carolina with a family who loves him. Remember Phoenix? He was so scrawny and sad looking. Well look at him now that he has a wonderful home with us. In the past 8 months he has a full coat of curls and he has almost doubled his weight. I thought you might like to see him now. The sweet lady, on the right, with the cow-lick is his sister "Abbey"
Mr. Phoenix Will is a whopping 89 pounds and not one ounce of fat on him anywhere. He has long passed the scrawny "bad hair" dog that you all saw last. He is doing wonderful. We still have A LOT of hyperactivity and he requires to be touched at all times. We have never been able to get him to the point of being off the leash when outside. He and Miss Abbey are like peas and carrots. Life is really good. If you are sitting in the recliner chances are Miss Abbey is lying on the foot rest. Phoenix will sit on the floor and face her. She gently pats him on the head and cleans his face like a mother would take care of her son. This goes on for at least 15 minutes. Thanks to your generosity, Phoenix is living happily now and has blossomed into a handsome young man.